1 Albrecht-von-Haller-Institute of Plant Sciences, University of Göttingen, Untere Karspüle 2, 37073 Göttingen, Germany; <florianwerner@yahoo.com>. 2 Department of Biological Sciences, Florida Atlantic University, Boca Raton, U.S.A; <kledes@yahoo.com>. 3 Colegio Nacional Eloy Alfaro, Gonzales Suarez y Sucre, Cariamanga, Ecuador; <rodrigohb20022002@yahoo.com>. Key words. Biogeography. Caviomorpha. Distribution. Hystricomorpha. Viscacha. Chinchillidae is a family of hystricomorph rodents distributed in the Andes of Peru, Bolivia, Chile and Argentina, and in lowland plains of Argentina, Bolivia and Paraguay (Redford and Eisenberg, 1992; Wilson and Reeder, 1993; Eisenberg and Redford, 1999). The family comprises three genera: monotypic Lagostomus, two species of Chinchilla, and a debated number of Lagidium species. The three species of Lagidium most widely accepted are L. peruanum, L. viscacia, and L. wolffsohni. 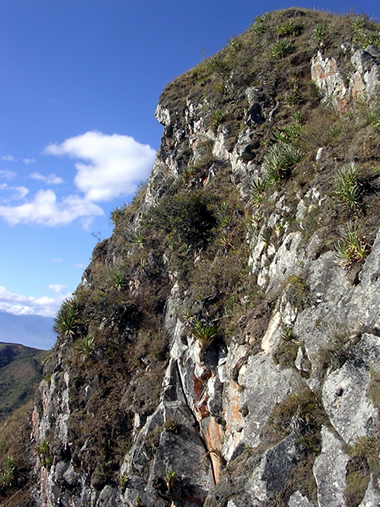 L. peruanum inhabits the central Andes (Puna), the Western Slope, and the lomas of low coastal ranges in central and southern Peru, and northern Chile (Woods and Kilpatrick, 2005). Known records of this species establish the northern range limit of Chinchillidae at around 9° (Grimwood, 1969; Pacheco, 2002) to 10° S latitude (Rowlands, 1974) (Fig. 1). Although this species is most commonly found from 3000-5000 m, it descends at least to 600 m in the lomas (Pearson, 1957; Grimwood, 1969). L. peruanum is closely associated with large boulders or rocky cliffs where deep crevices and narrow stony tunnels offer shelter and nesting sites (Pearson 1948). Pearson (1948) described the natural history of L. peruanum from the Andes of Southern Peru where locally the species was common. Fig. 1. Geographical distribution of the genus Lagidium. The arrow marks the location of Cerro Ahuaca. Modified after Rowlands (1974). Cerro Ahuaca is a granite inselberg 2 km from the town of Cariamanga (1950 m), Loja province (4°18'29.4'' S, 79°32'47.2'' W). The Cerro stretches from ca. 2000-2480 m, covers around 120 ha and features extensive areas of rocky surfaces ranging from almost unbroken to moderately structured. These rock faces are inclined from ca. 40 to over 90°. Large boulders are quite common, especially on the lower, gentler slopes. The local climate is distinctly seasonal with the wet season typically lasting from January-April. Precipitation and temperature in Cariamanga average 1264 mm/yr and 17.8°C respectively (INAMHI: Instituto Nacional de Metereología e Hidrología, 1950-1999). The vegetation of the area was classified as dry montane scrub (Sierra, 1999) and has been heavily deforested particularly in recent decades. Today a belt of secondary scrub and forest on the lower and middle slopes buffers the mountain-top against surrounding pastures and crop fields. The vegetation of the summit area is influenced by fire and cattle grazing and is dominated by Poaceae, especially Melinis minutiflora. This naturalized grass is promoted by repeated fire and regularly attains covers of >50 %. Other characteristic plants include Agave americana and Furcraea andina (Agavaceae), Tillandsia lymanii and Puya sp. (Bromeliaceae), Armatocereus rupicula and Opuntia sp. (Cactaceae), and Streptosolen jamesonii (Solanaceae). A group of at least two adults and one juvenile of Lagidium was observed in July 2005. The animals were resting in the close vicinity of an entrance to their den, a deep rock crevice on a ca. 80° steep cliff at 2450 m (Figs. 2, 3). The animals were timid and not seen moving farther than ca. 2 m from their den during several hours of observation. 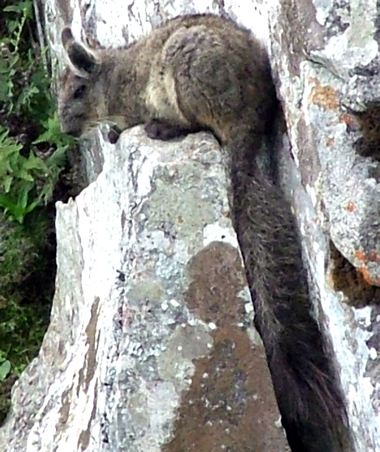 Moderate amounts of vizcacha faecal pellets were found scattered on top of rocks and boulders and in entrances to dens around the summit of Cerro Ahuaca. Faeces and traces of vizcacha herbivory were also present at the base of a rock face at 2310 m bordering a scrubby cattle pasture rich in rocky debris. Fig. 2. Vizcacha habitat at Cerro Ahuaca (2450 m). Fig. 3. Mountain vizcacha (Lagidium cf. peruanum) at Cerro Ahuaca. Photo courtesy of LF León. We must presume this population represents L. peruanum, a species known for high variability in coloration even within single populations (Pearson, 1948). However, considering its great geographical isolation from Peruvian populations, the possibility of the Ahuaca population forming a distinct species can not be dismissed until anatomical and genetic studies are carried out. A recent study of Lagidium in Chile and Argentina revealed surprisingly large genetic distances between subspecies, indicating the existence of more species than currently recognized (Spotorno et al., 2004). The vizcacha at Cerro Ahuaca is unknown to the local people in Cariamanga and is not hunted. However, this population faces other threats. The major threat is fire, widely employed to establish and maintain crop fields and pastures throughout the region. Such fires regularly escape control destroying large areas of vegetation on the Cerro. Thus, fire destroys the food resources of vizcachas, alters their habitat and may kill animals directly. Furthermore, domestic cattle that graze summit and periphery of the Cerro compete for food with vizcachas. This may result in a reduced carrying capacity of the vizcacha habitat and, consequently, population size (Walker et al., 2000). Suitable habitat does not appear to occur anywhere close to the Cerro except from some isolated outcrops around its immediate base. Fragmentation of their rocky habitat is generally common, and colonies of vizcachas are often separated by 10 or 20 km even in uniformly suitably habitat (Grimwood, 1969). This makes a metapopulation structure presumable which could increase the survival ability of the population under pressure (Walker et al., 1994). However, we estimate that this population may comprise no more than a few dozen individuals. Furthermore, with 1-2 offspring per year (Rowlands, 1974; Weir, 1974) vizcachas have low reproductive potential, another characteristic rendering them prone to extinction (Henle et al., 2004). We strongly recommend the control of human activities on Cerro Ahuaca, as well as a study of human impact and natural history, size, range, dynamics and genetic structure of this population, and the quest for others in the wider area. The taxonomic status of the population is currently under study. Given the limited dispersal power of vizcachas, the population further gives rise to other interesting questions such as the presence of Lagidium in northern Peru or when a continuous range may have been disrupted. Thanks to Luis Fernando León and especially to Daniel Hidalgo; also to Veronica Saenz Marin for her assistance with the drawing of the distribution map. We gratefully acknowledge the support by IDEA WILD, MINOX and the German Academic Exchange Service (DAAD). This is publication No. 122 of the Yanayacu Natural History Research Group. Aceptación final 17 octubre 2006.